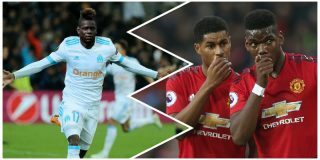 Mario Balotelli dismisses Rashford t-shirt rumour, calls it "a lie"
It was claimed that Mario Balotelli was wearing a Marcus Rashford t-shirt under his Marseille jersey as PSG won 3-1 to increase their dominance in Ligue 1. The rumour spread like wildfire on social media and we ran a report on it this morning. The claim was made that the former Manchester City striker planned to reveal the t-shirt to PSG if he scored, but he didn’t and was substituted before the end. This shirt would have aggravated PSG supporters after Manchester United knocked them out of the Champions League, thanks to a tie-defining penalty scored by Rashford prior to stoppage time. But it appears the whole Rashford t-shirt story was made up! Balotelli took to social media on Monday morning to dismiss the rumour calling it “a lie”. The Italian striker also called for fake stories to stop in his name. It makes you wonder where the rumour originally came from? How could someone get that so wrong without admitting they just made it up? Balotelli could be just covering his arse because he didn’t score and PSG fans might find this all very amusing.